As part of its FY 2020 budget testimony before the Legislature today, the New Jersey Business & Industry Association has released an analysis finding that New Jersey once again has the least competitive business climate in the region with the highest corporate income tax, sales tax, income tax and property taxes. “The proposed budget, which spends 3.2 percent more than the current fiscal year and 11.2 percent more than in FY 2018, looks to pay for the additional spending by raising taxes on our already overtaxed residents and businesses,” said NJBIA President & CEO Michele Siekerka. 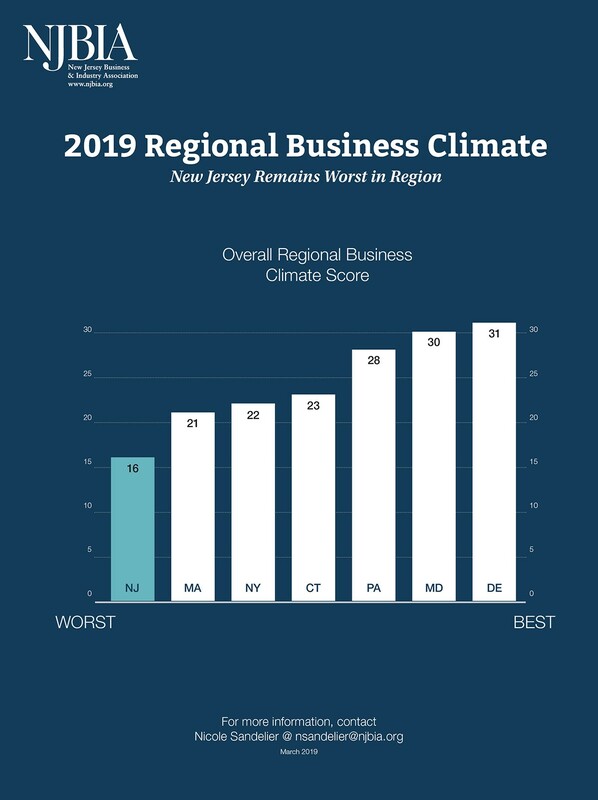 NJBIA’s 2019 Regional Business Climate analysis tracked six different business costs: minimum wage, top income tax rate, top corporate business tax (CBT) rate, state sales tax, property tax paid as a percentage of personal income, and top unemployment tax rate – and compared New Jersey’s rates to those of Connecticut, Delaware, Maryland, Massachusetts, New York and Pennsylvania. Applying a score of 1 to 7 from the least to most competitive regional rates, New Jersey finished last in four categories in 2019 and ranked least competitive overall. New Jersey has the highest top income tax rate (10.75 percent), highest CBT rate (11.5 percent), the highest state sales tax (6.625 percent), and the highest property tax paid as a percentage of personal income (5 percent). Last year, NJBIA’s 2018 regional analysis also ranked New Jersey as the least competitive overall, with three taxes higher than other states in the region: the income tax, sales tax and property taxes. However, the FY 2019 budget enacted in July raised the CBT to 11.5 percent (exceeding Pennsylvania’s 9.99 percent rate), which now places New Jersey last in four categories, instead of three. “We are going from least competitive overall to extreme outlier status and this is certainly not a move in the right direction,” Siekerka said. Analyzing data on tax rates from the National Conference of State Legislatures, state government websites, and the Tax Foundation, NJBIA scored New Jersey last in the region, five points behind its nearest competitor (Massachusetts) and 10 points behind the regional leader (Delaware). 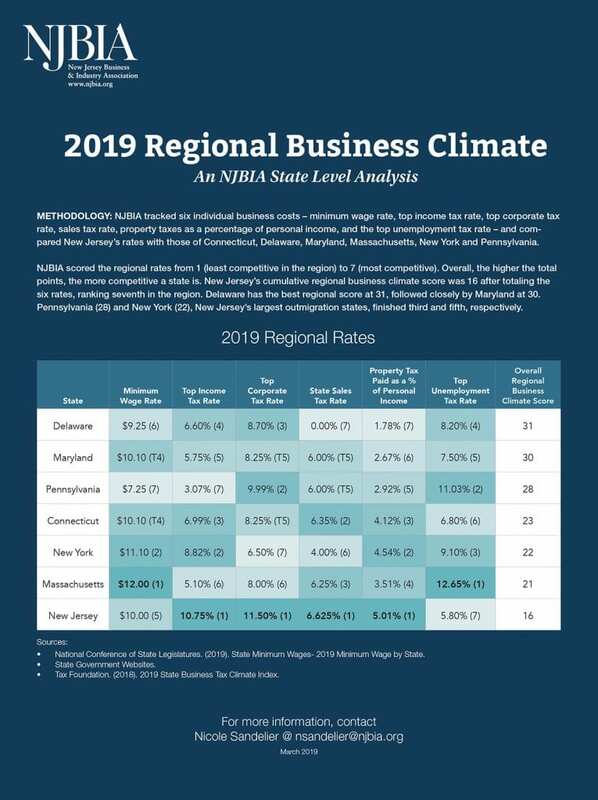 The two-page NJBIA infographic, including a table of 2019 tax rates in the seven states compared in this analysis, can be found here. The full written budget testimony of NJBIA Vice President of Government Affairs Andrew Musick can be found here. Phil must be breaking open the champagne – he obviously hates big bad business, especially small businesses. He just wants everyone to get a paycheck for sitting home – wonder where the money will come from once he puts small business into bankruptcy? When will the folks in Trenton “Wake Up”? I worry it’s going to be too late and the jobs and job creators will be gone. Who is going to be left to pay the bills??? NJ is a great place to live and work, with many attributes but, there are limits to which people will pay to stay. Murphy and all his cohorts do not care. They want to totally destroy NJ. They do want a total dependency class that will only vote for all the give stuff. There actions are done by design. I have had it and plan on leaving NJ as soon as I can. I am closing down 2 companies and heading somewhere reasonable. I will no longer pay over 100,000 in taxes. With less competition the prices will just go up. I want to live not just work?? It is unsustainable and ridiculous how expensive and overwhelming it is too live here. This coming from someone who has lived here all my life. Good By to NJ as soon as I can!! Going to live where I don’t pay 14,000 plus just in real estate taxes to live in a dump compared to other states.